Like all Doosan ADTs, the new DA30 and DA40 models feature an articulation hinge positioned behind the turning ring to provide equal weight distribution to the front axle even during maximum steer articulation. This together with a free-swinging rear tandem bogie ensures equal distribution of weight to each wheel and guarantees permanent six-wheel contact and drive for equal power distribution and excellent performance on difficult terrain. Collectively, the forward turning point, the unique tandem bogie and the sloping rear frame results in ‘best in class’ rough and soft terrain capabilities and avoids the need for electronic aids such as traction control. For the DA40 model, for example, the body capacity has been increased to 24.4m3 and the payload has been boosted to 40 metric tonne without tailgate, an increase of more than 15% over the payload of the previous MT41 model from Doosan. In both the new DA30 and DA40 models, the higher speeds and payloads contribute to reduced cost per tonne rates, allowing customers to increase profits from their mining, quarrying or earthmoving operations. In response to requests from ADT users, Doosan will be supporting the high performance of the DA30 and DA40 Stage IV/Tier 4 Final machines with a new (optional) tracking system designed specifically for use on Doosan ADTs, providing full information on payloads, fuel consumption and cycle times. 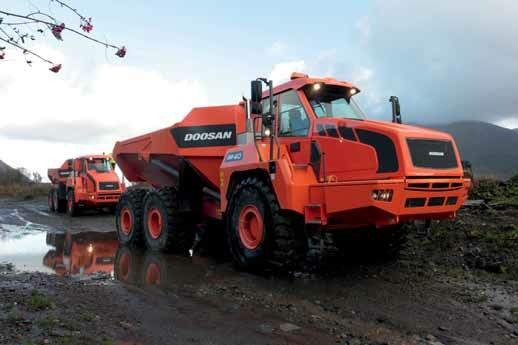 In addition, the company recognizes that fuel efficiency is very much dependent on the skill and experience of the operators and for this reason, Doosan has a team of trained demonstrators available to visit customers’ sites in Europe to train up drivers in the most fuel efficient way to operate units. For reduced maintenance, as well as better stability, the turning ring mounted on the front part of the truck also results in less wear on tyres and driveline. The unique driveline concept, with only two differentials, also limits component wear. Other aspects that contribute to the reduced cost of ownership include just three wear parts on the rear frame — one tandem bearing on each side of the frame and one articulation point bearing. Installed in the factory as standard equipment, the auto lube system is managed by the machines’ VCU so that it pumps grease to all sections of the trucks only when required. A new ‘one-key solution’ gives operators access to all compartments of their machine via a single key.